You may replace your wiring harness on your Duetto, it is not that tricky after all. 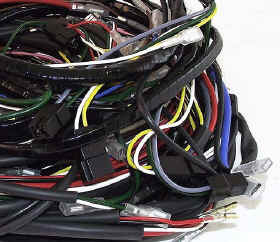 New wiring harnesses/looms cost a lot of money but can be done by yourself. Here is the wiring chart made by Papajam. Thanks. Or this UK vendor as well. www.autosparks.co.uk so the choice is up to you. You will need wires in different colours, they all are square 1mm as original. Go for the Single core PVC Thin wall cables as they are the latest version and much lighter and smoother than the old PVC wires. 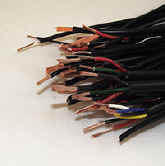 Some wires, red on the wiring chart are thicker, but you will see when you start which they are. The chart below is what I used for my Euro 1750 Veloce Duetto. Mine has a fuse box with ten fuses as in the diagram. The US will need additional wires and colours. Just add them after checking what your Duetto has. The Spica and side markers for instance. The wiring charts for those are at www.duettoinfo.com Pls see page 114 and 115 or straight to the wiring chart as a Pdf. There are charts for the other 105 Alfas too, 1750 Berlina, the Bertone and of course the Duetto. Wires. All wires are square 1mm apart from some of the red. Please see wiring chart. Here is my estimation about the wires and connectors. Sleving to protect the wires. PVC or Twist wrapped. Or you may use electric tape as original or conduit sleeves. It's up to you. The vendors in the article have everything you need..
You will need at least wires according to the chart above. The list above is just what I got and used. The good thing is that the wires are not expensive. The wiring harness runs from the fuse box to the A-pillar and tail loom runs over the left sill, then the B-pillar into to the trunk, left side. On the way there is an eight ways connector. The fuel tank sender is on top of the tank. The licence plate lamps are running inside the boot lid, left side. Oh, the fuse box has a fuse #1 that serves the cig. lighter and cortesy light on the mirror. If you don't use these, it is a good idea to connect the brake lights through that fuse. The wires continue to the left rear tail/brake light, then the connector with four ways takes care of the light assembly incl. the repeator/turn signal. The right rear light unit uses a four ways connector too. The total length you will need is in the chart above. The head lights wires runs from the fuse box into the engine bay, carb side and then over the radiator. The front repeaters/turn signals and parking lights do so as well. 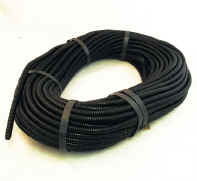 Four meters should be enough but as the wires have a modest price, get some extra. Behind the dash, it looks like a terrible mess, but if you replace the wires one by one using the same colour you can do it. And save a lot of money and have a good time with the colour new wires. The wires for the headlights an turn signals and parking lights go through the firewall right side, close to the fuse box. Start at the fuse box and place the new wires along with the old ones to get the proper length and position. Then when you are ready cut and crimp the connectors and so on. New wires are far better and have better plastic cover.